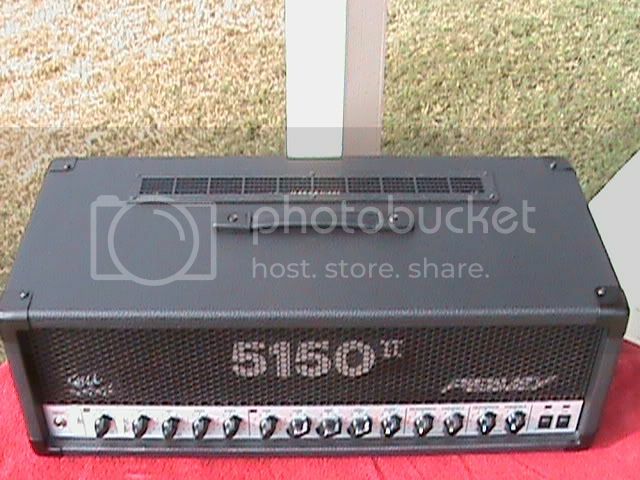 Hey guys, I bought the 5150II that sounded great. I got it cheap because it was cosmetically in bad shape. I called Peavey and they were nice enough to charge my credit card for new knobs, handle, rubber feet, tolex, and other misc replacement items. 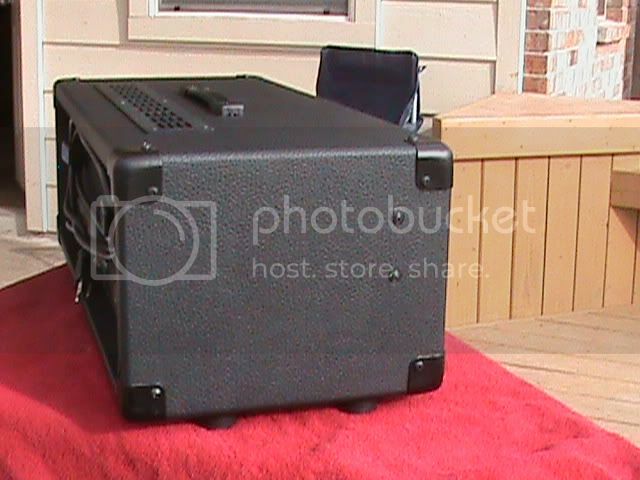 If the weather stays above 60 this weekend I'll start the re-tolex job and post the pictures here as I go. I've never done this before but I've read a lot on the web on how it is done. I'm told it will take several days so check back and see how I'm doing. I'll try to post pictures on Sunday...got plans tonight to see Metal Shop then Saturday I have a gig. Looking forward to it. I've got a Marshal cab that needs to be recovered badly. Well, the weather man was correct. It's just above 40. I'll have to wait until the weather gets above 60 before I can start this project. I promise to put up the changes as they happen. It appears it won't happen until after Christmasn. I'm just up the road from you and it's freezing up here. Will be playing NYE at the Hotel Valencia on Houston. That is awesome. The hotel gig should be sweet. Yeah, way too cold for my bones. But it heats up in a couple of days. We took off this next two weeks and don't play again until the 9th of January. It's nice to be off but I do miss not playing. Yeah. We took the last 2 weeks off and I'm dying to get back on stage. Play a local bar on Friday, Valencia on NYE and then Killeen on the 9th. Too cool. You guys do a lot of what we do. We're right down I-35 from you in San Antonio. Check www.irisrocks.com. I know we have a myspace page but I have no idea what the url is...lol. Alright here it is. The project is almost done. I still have the front side to finish but here is a pictorial of what I've done so far. Background story. I have always been a VH fan and had a 5150 back in 1996. Fast forward to 1999 and I'm auditioning for a band called IRIS - local to San Antonio, TX. I made the gig and we've been happily gigging since. Over the course of a couple of years I always wanted a Marshall. So I picked one up and fell in love. The 5150 sat and later I got an offer from a buddy - I sold it...stupid me. I kept that baby in top shape so I did get paid well for it. 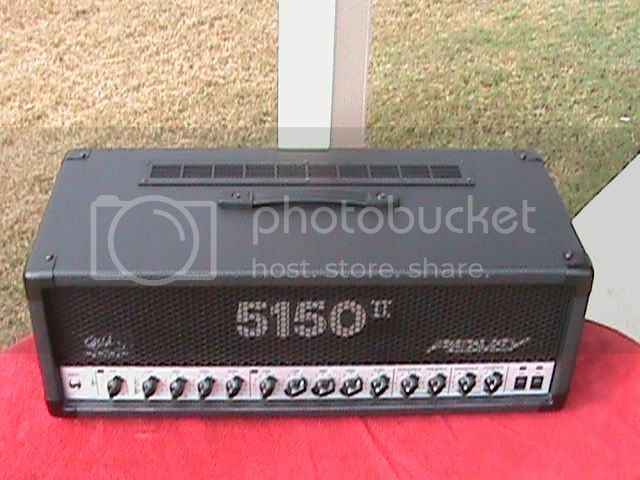 It's Sep 2008 and I still have my Marshall TSL 100 and the VH reunion returned some of those feelings I had for the 5150. I searched ebay and craigslist. I knew I wasn't going to spend a lot for a used one. It had to sound good and be in top shape (technically). 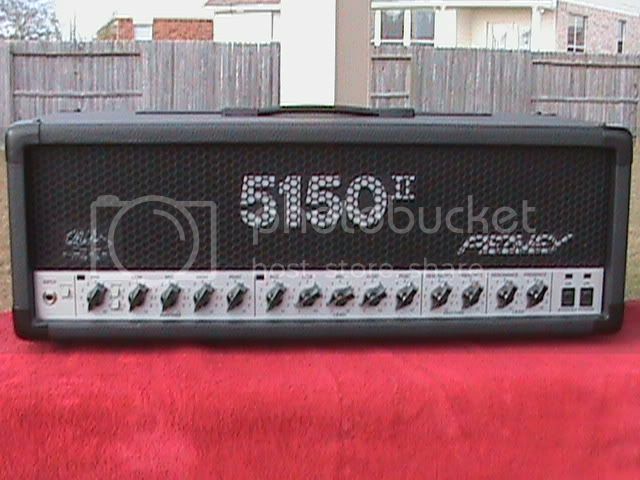 I found a 5150II that sounded awesome. The footswitch didn't work but I knew I could replace the switches with ease. The was done in the first three days that I owed the amp. It's Christmas 2008 and I have some vacation coming up. So, I called Peavey and ordered new tolex, metal corners, a handle, rubber feet, a new screen vent, knobs, and additional screws. Here is the work in progress. Here are some pics of the head before I removed anything. I actually cleaned up the tolex with a damped cloth to remove the dust and crap that the previous owner let build up. and of course I removed the chassis from the box. Now that I have the chassis removed I then removed the metal plate that has the serial number and model number on it. I used a flat head screw driver to pry it off the wood. Came off very easy. Now the fun part. I started peeling off the old tolex from the seam on the bottom of the box. I started it by pulling on the corner (tolex that was handing loose) and carefully pulled the entire tolex off. The old tolex will be used as a pattern to cut the new tolex. And now the naked box with the old glue still on. Tools used to pull the tolex off...my hands with some elbow grease. Now I need to use the palm sander to remove the glue and smooth everything out. I used a plam sander with 60 grit paper first. This took me about an hour to complete the entire box but it's something you want to do right. I've read that a belt sander should be used. I didn't have one available so I stuck with my elbow grease and a plam sander. The palm sander worked well IMO. The glue inside of the box was easy to remove. I used a steal brush and it came right off. Once I got the glue removd I used 150 grit to smooth everything out. Now that I have everything off I took the old tolex and placed it on top of the new tolex and cut away. 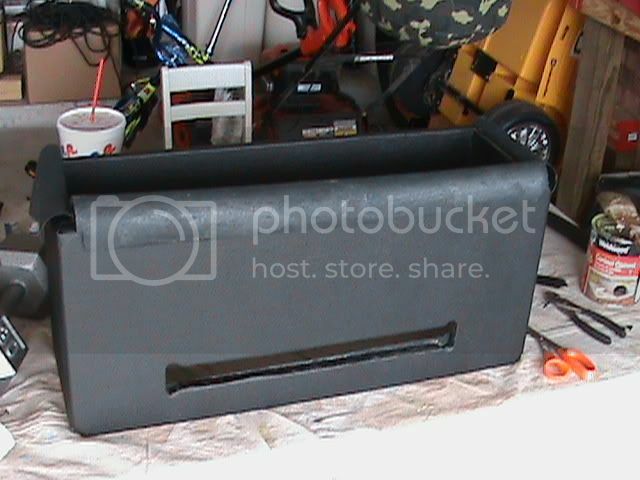 Once I had the cut out I put contact cement on the side I was covering and the tolex. Wait 10-15 then put the tolex onto the box. I have all four sides glued but since it's dark right now I couldn't get a good picture of it to post here. I'll start back up tomorrow. If things go well I should be done. 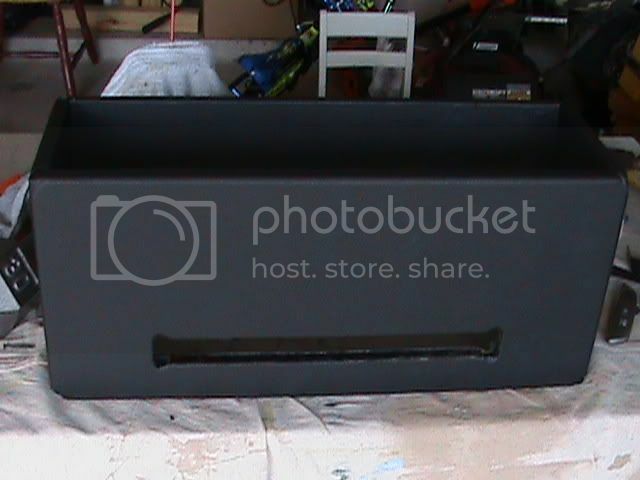 Here are the finishing photos. Before I started this project I researched the internet and many forums. Many sites were helpful but I printed out the instructional sheet from the link below and used that as a guide. Each project is different so take something from each and apply it to your own project. My best advice is to plan ahead. The more you plan and the more you know what you are doing - before you do it - the better. This was a lot easier than I thought it would be. It did take patience but it was well worth it. If you attempt this project I would recommend a couple of things. 1. Buy all of your parts directly from Peavey. Their prices are very low. I had to replace some of the knobs and it was a lot cheaper buying from Peavey - I paid ~50 cents compared to a couple of dollars from Peavey dealers. At the very least price shop using the internet. You can always find a better price somewhere. 2. Do your research before you do anything. Some people recommended other glue products that were more costly. I found the contact cement from Lowes/Home deport was perfect for the job. And it was a lot cheaper. 3. Try to remove the old tolex in one piece. If you do that you can use that as a template to cut out your new pattern. For additional information check out the link above which has more detailed information. Thanks everyone for your support and especially to those who have posted pics and information from other forum sites. If no one shared this information I probably would have never attempted this.